Bray Wyatt has obtained the dark lantern, ‘a source of maddening light’, his hour of triumph within reach. Until Triple H elbows him in the jaw and The Authority unleashes its power for themselves, spawning wild incarnations of the WWE Superstars who now endlessly lay waste to one another. Think that sounds like piece of fan-fiction? I can’t blame you, but it is in fact the setup for WWE Immortals. 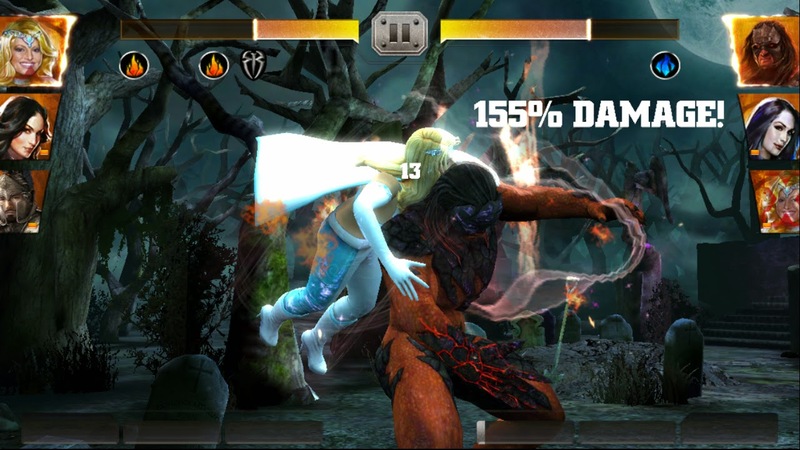 As a fighting game, WWE Immortals has to make some concessions to make itself playable using the limited inputs of mobile platforms. 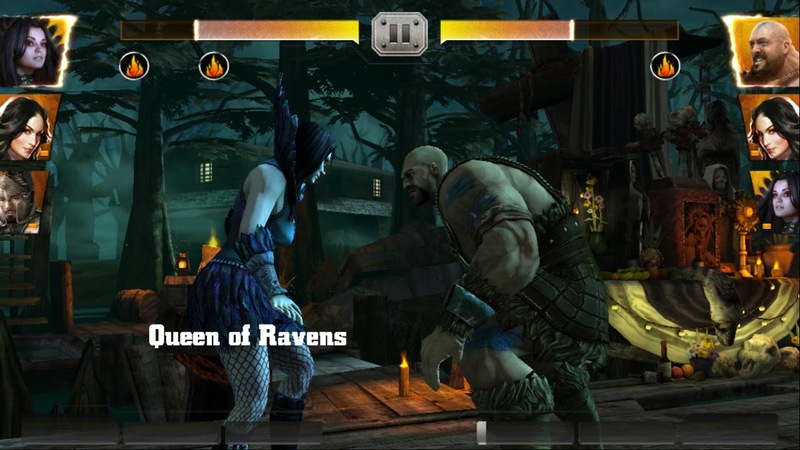 It is in essence, a re-skinned version of NetherRealms previous mobile fighting game, Injustice: Gods Among Us. The controls are very simple; tap to attack, slide to perform a heavy attack, and hold two fingers on the screen to block. You build an adrenaline meter to perform super attacks, they have three levels of potency, each with their own animation and can be boosted by tapping or sliding the on-screen prompt. Similar prompts also appear to finish combos. 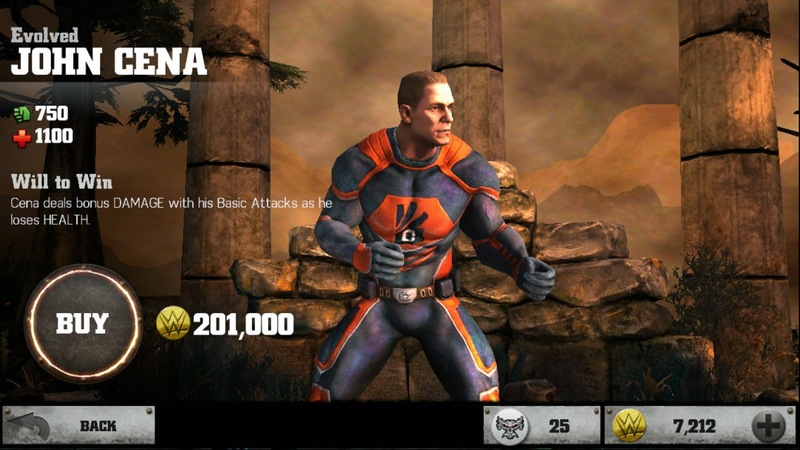 Some of the supers look great, and are inspired in their design, for example, in John Cena’s level three super, he summons a Humvee on screen which smashes into his opponent. However, there is no control over movement, position, or direction; you will always be on the left of the screen, your opponent on the right. This makes fighting is extremely simple, all you do is tap away and occasionally block, this simplicity is compounded by the extremely passive AI enemies. As a result single player mode is just a straight grind, the multiplayer game mode is where the action is at. Compared to Marvel Contest of Champions, a very similar style of game, but one which allows movement and has a vastly more active AI opponents, Immortals just feels overly basic. Unlike Contest of Champions, you choose a roster of three characters that can be tagged in during a match, each character specific allies and rivals. Fighting alongside allies or rivals will tweak the statistics of the fighter. Once I had levelled up my characters sufficiently and seen all their super moves, I found it difficult to want to continue to play, the gameplay just isn’t deep enough to warrant further attention. The multiplayer mixes in some different elements outside of the fighting. There is a player profile that can be levelled up and customised, with unlocked icons, banners, and titles, and there is the concept of Battle Rating. Battle Rating determines your position in a given season’s leaderboards, the higher your position the greater your rewards will be, it is acquired by winning matches and completing daily quests. The presentation of WWE Immortals is a whole lot less mundane. The stages are brooding and bizarre, and the animation is really good, but the commentary feels like a wasted opportunity though; on the Edit Team screen the commentator yells the characters are names, but doesn’t in the fights. The wrestlers remain the stars of the show, while there aren’t yet many, there are alternate variants and they all look fantastic. Some are fantasy characters, some super heroes. John Cena has a soldier version and a ‘Evolved’ super hero skin, Roman Reigns dons his Roman centurion armour, Paige can be a dark sorceress or banshee knight, and then there is Daniel Bryan… Daniel Bryan is just Daniel Bryan, wearing a ‘Yes’ t-shirt (there is also a ‘No’ variant) and he seemingly can’t move without pumping his arms into the sky. It is amazing. In true mobile free to play fashion, WWE Immortals features an energy meter, to constrain your playtime, as well as microtransactions. Paying real money will allow you to bypass this energy meter, or buy Immortal Credits, these are also earned through play. It doesn’t take more than a few games to be able to purchase the cheapest booster pack available. Booster packs contain characters, talent cards, and gear cards. Characters and talent cards can also be bought individually. Talent and gear are used to unlock and upgrade the abilities of the characters, gear must first be forged, which costs yet more credits. 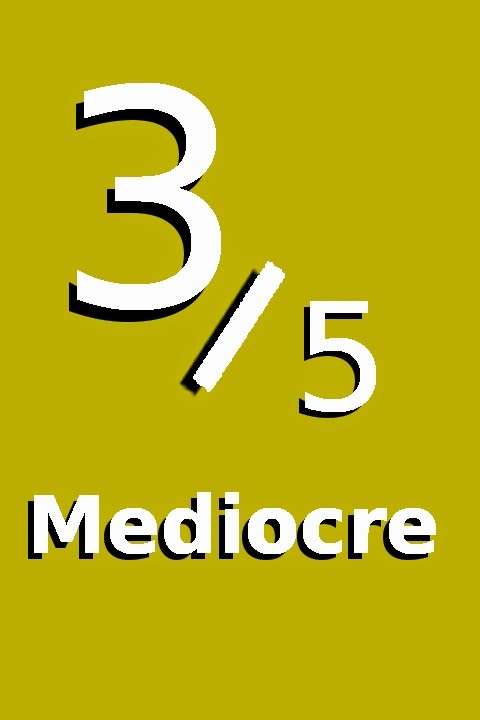 The time taken to acquire the cheapest pack is not excessive, but it quickly ramps up, and naturally the more expensive cards have better statistics; you will either have to save for a good long while or purchase them with real money. For reference, gold tier ‘Evolved’ John Cena costs 210,000 Immortal Credits, 192,000 costs £14.99 (which converts at more than $22). It’s a free to play game so that’s not unexpected, but seeing no viable way to progress without paying more money than I would like, was a surefire way to kill my interest.